Mark Bradford, Pickett’s Charge (The Thunderous Cannonade) (detail), 2016-2017. Mixed media. Courtesy of the artist and Hauser & Wirth. Photo: Joshua White. 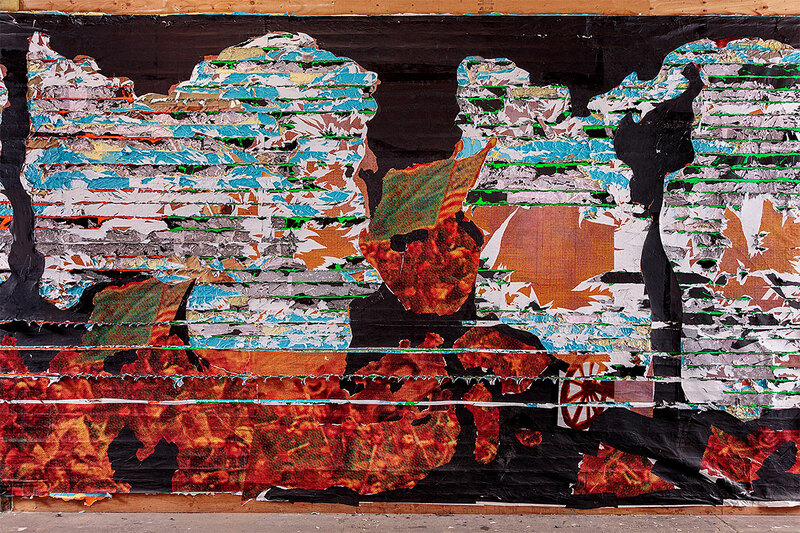 Internationally renowned artist Mark Bradford (b. 1961) debuts Pickett’s Charge, a monumental new commission inspired by artist Paul Philippoteaux’s nineteenth-century cyclorama in Gettysburg National Military Park, Pennsylvania. Philippoteaux’s cyclorama, created in 1883, depicts the final charge of the Battle of Gettysburg, which historians cite as the critical turning point of the Civil War and, consequently, of American history. Working with a combination of colored paper and reproductions of the original, Bradford collages and transforms the historic Gettysburg imagery into a series of eight powerful, abstract paintings. Each painting is more than forty-five feet long, and together, they encircle the entire Third Level in a 360-degree panoramic experience. By cutting, tearing, and scraping through the layers, Bradford reveals the hidden textures and complexities lurking just beneath the surface. The resulting work weaves past and present, illusion and abstraction, inviting visitors to reconsider how narratives about American history are shaped and contested. Posed with his trademark fearlessness, Bradford’s open questions—or rather, the deliberations his work elicits—are particularly timely in contemporary America. And considering that the Hirshhorn is situated on the National Mall, these questions are made even timelier. Pickett’s Charge builds upon the Hirshhorn’s continued commitment to showcasing the ways that artists respond to the unique political and cultural climate of their time, as well as the Museum’s distinctive architecture. Through its free exhibitions and public programs, the Hirshhorn is dedicated to fostering conversation around the forces that shape creative expression in the twenty-first century. Bradford (b. 1961) is a Los Angeles–based artist whose work addresses socio-political issues, as well as art history. For over two decades, he has expanded the language of abstraction through imbuing his compositions with personal experience and historical significance. Pickett’s Charge is Bradford’s first solo exhibition in Washington, DC, and his first major American solo show following his presentation as the US representative for the 57th Venice Biennale.